As mentioned, Ragnarok isn't really much like Wolf3D. 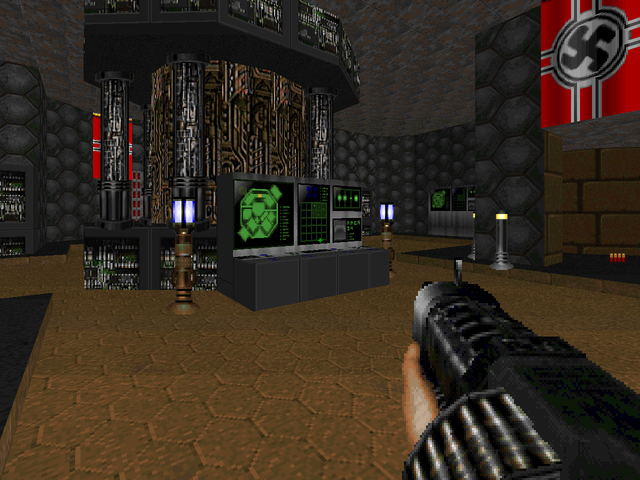 Its architecture and layouts bear a much stronger resemblance to Doom's maps, outside of a few isolated areas, most notably the beginning of MAP02 and what I can only assume is a callback to Wolf's infamous jail cell opening in MAP03. The architecture is generally decent, if uninspiring, with a few major exceptions like Muspelheim and its neat opening. The early, Nazi-centric maps suffer the worst, especially with the emphasis on the garish silver texture found in the base segments. There are some graphical errors, to be expected in a freshman effort, but there's one major bug, encountered at MAP03's exit. If you bump into the linedef, which is actually a switch, it will deactivate and you'll be stuck forever. 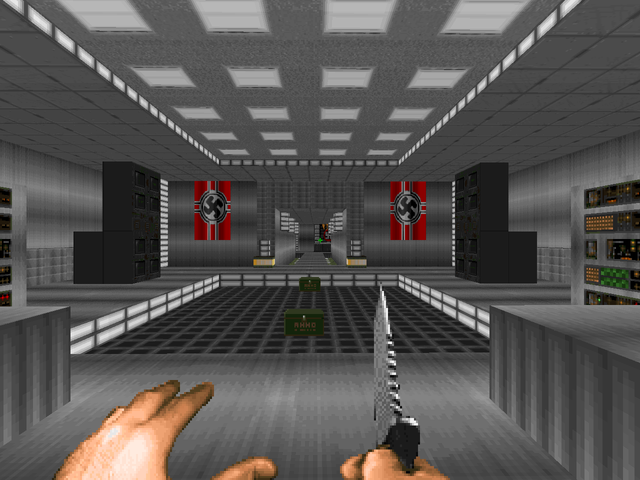 Combat is a slog through hitscanners until partway through MAP04, where you more or less ditch the Nazis until the end. 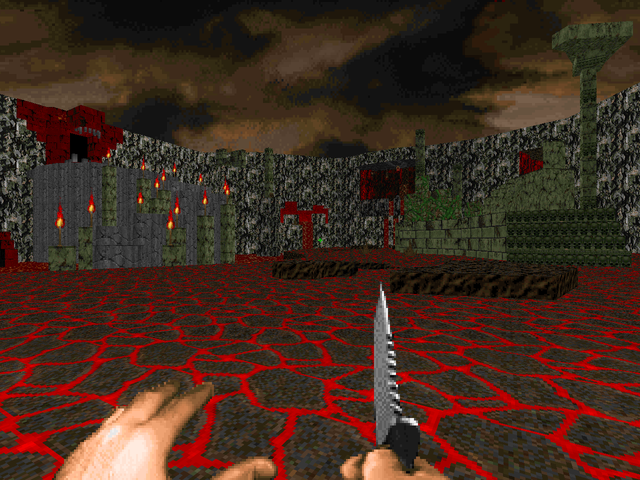 Some of the fights are actually pretty tricky, most notably the huge caldera of MAP08, and MAP06 ("Nexus") has plenty of engaging combat scenarios throughout. On the flipside, there are a fair number of puzzles to solve. Keep an eye out for shootable switches in the Hell maps. They might slip by as they don't look like your typical projectile-activated mechanisms. There's another bigger issue with the penultimate map, but considering the size of the area you're locked into, you're bound to figure it out sooner or later. And, uh, some hanging bodies that irritatingly block movement, the worst instance found near the very end of the WAD. Also worth mentioning - Loki re-skinned a number of the weapons. Most of them are serviceable, even if I think the whole endeavor is pointless. 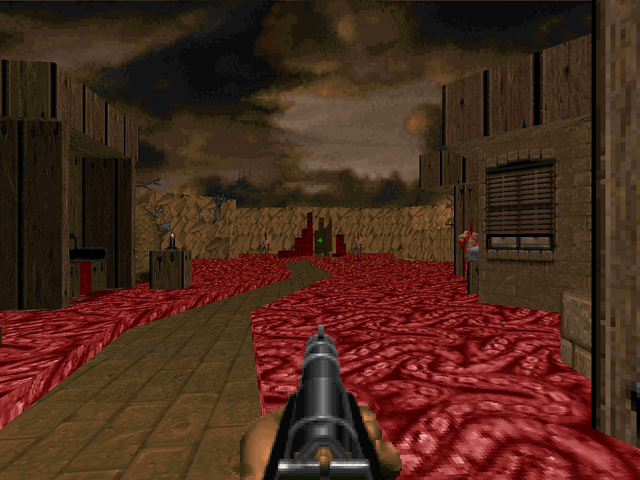 The pistol is woefully off-center, though, rendering it impractical for bullet sniping, and the chaingun looks out of place as it's oriented to the right. Sprite replacements or no, Project Ragnarok is far from one of the best WADs released in 2011, but it got some smiles from me. Loki shows some promise as a mapper and supposing his negative reception hasn't left him sour, I'll be happy to see him join the rest of his compatriots in pouring their fevered imaginations into the mould of Doom. I only hope that he's gotten all the Nazis out of his system; I can't say that they're very fun to fight. Small underground bunker with some large, open rooms and plenty of Nazi iconography. It's well put together, but suffers for its emphasis on the unappealing silver textures and exclusive use of SS Troopers as enemies. They're just not that interesting to fight. 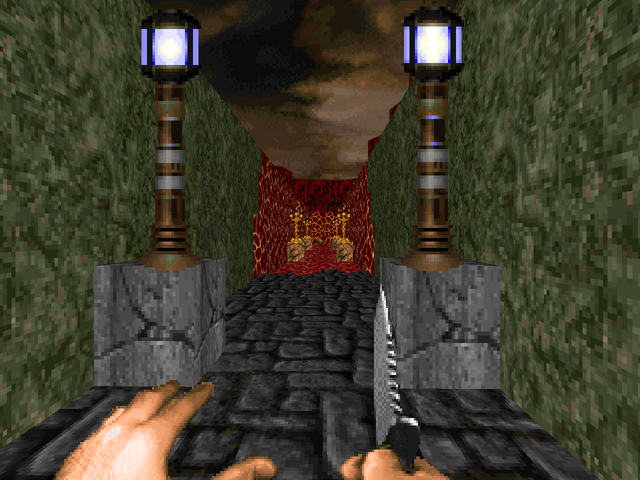 The most interesting segment is the slightly tricky platforming segment to the red key. 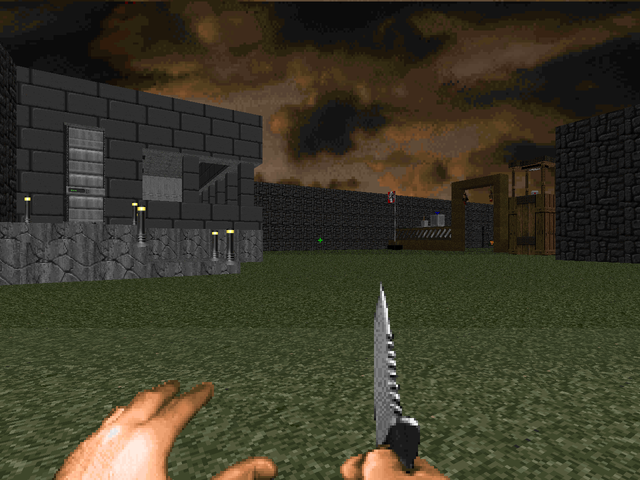 The enormous concrete period in contrast is quite boring to scale and offers nothing interesting combat-wise. Ditches the silver base theme, plunging dead on into something more Gothic / Satanic. 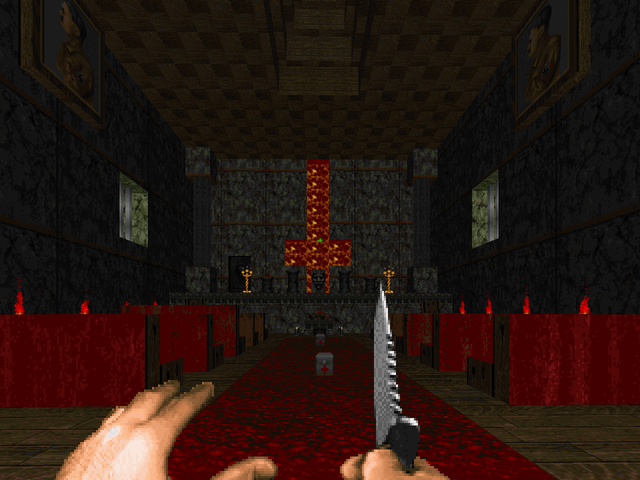 The resulting rooms are a bit easier on the eyes, particularly the unholy cathedral, though the return to the base theme at the end is jarring. Still nothing interesting in terms of combat; just check out Loki's little set-pieces. 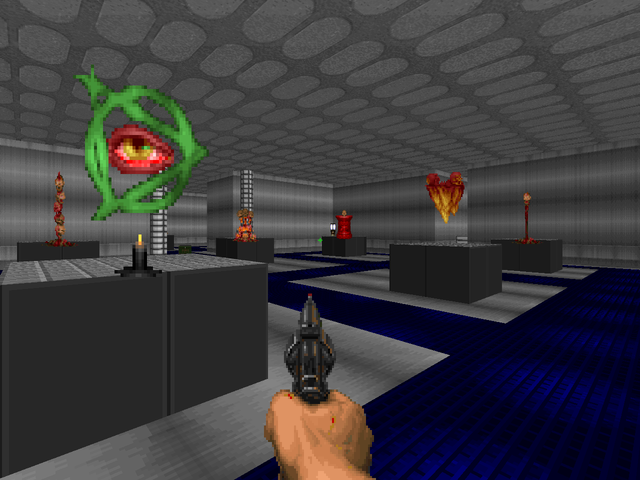 More base, but Doom's more familiar bestiary finally makes an appearance, though they're sparsely situated. Mostly this just communicates the unspoken "story" of the WAD – it looks like the Nazis have been making trips through the portal to Hell, culminating in specimen retrieval and a museum of Hellish artifacts you're free to peruse. Some nice lighting helps to rescue what's mostly pretty bland architecture and detailing. The opening here is a little awkward, exposing you to a number of troopers without a lot of cover. You quickly move on to some infernal Stonehenge, sequestered away by your hosts and functioning as a portal to the nether realm. It's a welcome departure, ushering in imps and other Hellspawn to liven things up. The ending room in particular stands out, though the ruined bridge before it has a nice little crossfire. The Hell theme continues with an usually bright romp through otherworldly topography. It's pretty rote stuff up until you enter the fortress, which has a tricky first fight on nukage with two barons to take down. This flows into your usual granite caverns, populated by imps. When you return to the cesspool, you'll find someone new to play with, which depending on your remaining ammo may or may not be a breeze. 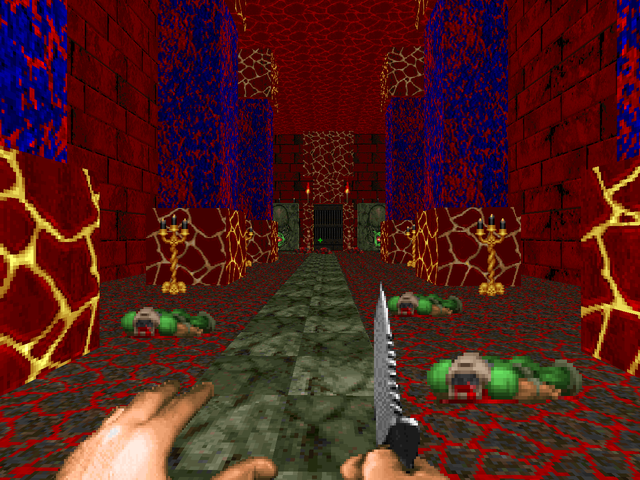 Here's an unusual Hell map, taking place underground through a series of caverns, showcasing Hell's more colorful side. 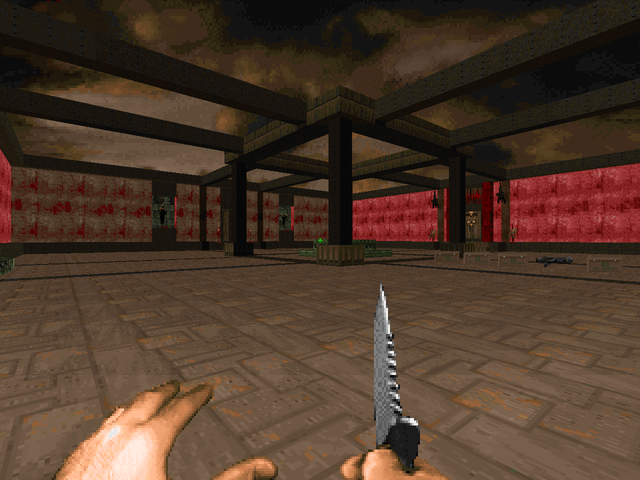 It's also got some tricky opening fights, like an early arch-vile with limited safe room (damage floor surround). The big showcase is a dangerous chasm with revenants standing on pillars and an unsightly ambush to contend with. After a stopoff at a particularly evil temple, there's another stretch of granite caverns. It's not awful but a little care in lighting would have gone a long way to adding a lot of atmosphere. 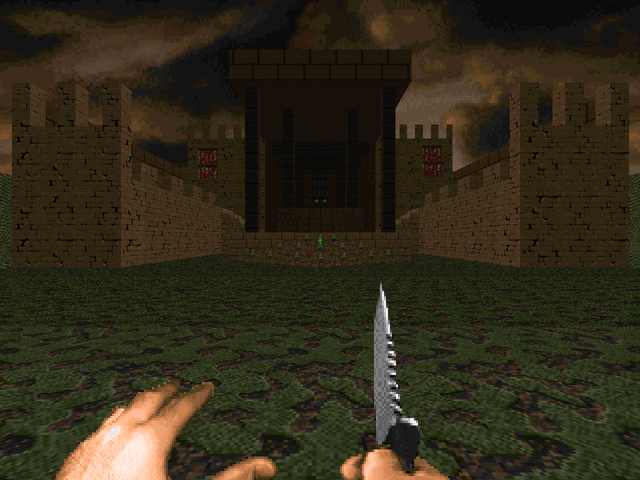 Ditching the Hell theme for something more resembling a castle, with a courtyard and several instances of battlements, most notably the eastern red rock segment which is very tall (but very plain looking). There's a winding tightrope section which is bound to annoy some players with its introduction of lost souls on the journey back. And, finally, a baffling pyramid in Hell protected by a cadre of the mostly harmless. The change in scenery is nice, I'll give him that. A very large level with some interesting ideas. First of all, you start out in a dragon's mouth and emerge into a fire and brimstone Hell. It's a large map with tons of traps and a few more of those shootable switches. The toughest part is a huge, outdoor crater with a tiny tower in the center. 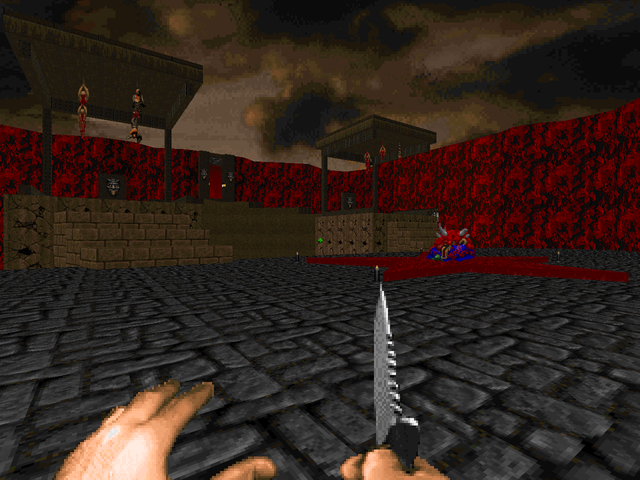 You'll be dodging fireballs from all sides trying to work your way up while demons block your path. I don't really care for the large red rock room soon after, but there's a neat little CYOA bit at the end. Choose the correct path and you'll be rewarded. Well, on top of not suffering damage. Something different in the vein of a challenge map. 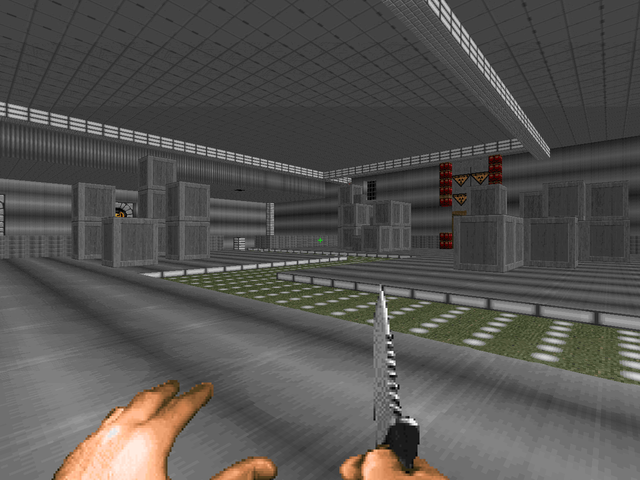 It's mostly happy fun times with the rocket launcher, though you really want to grab the two secret weapons. You can tackle the wings in any order you like, but you can't leave until you grab each key. 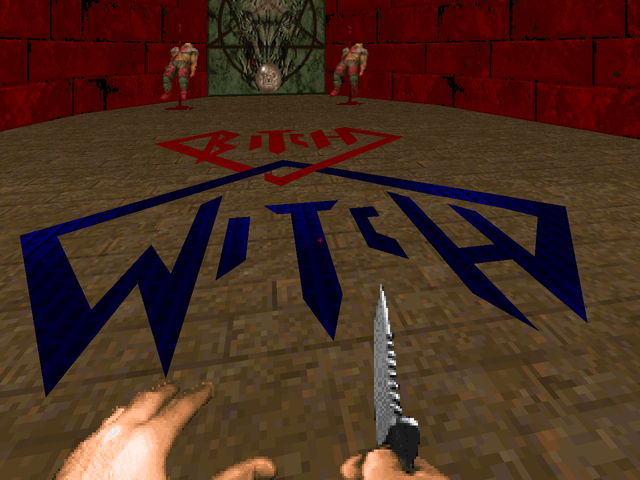 There's a Cyberdemon, a Mastermind, and even some fun with the barons. The finale involves a slightly atmospheric marble temple and a Romero head you have to kill. The solution to the puzzle is distressingly located in a secret, though it's admittedly nearby. A return to the earthen / Nazi base theme. Thankfully, the S.S. Troopers are in short supply. The big highlight is a huge progressive courtyard fight involving monsters on the ground and waiting in the wings as you storm past their defenses, the nastiest part being that row of chaingunners in the northeastern building. The rest is ho hum with some nice light fixtures, but there's a pleasant park area with a hedge row in the back. Passing through brings you to its evil alternate before you arrive at the “dead end”. I think he could have arranged a better ending, but, whatever.